An Interview with Author Segilola Salami! Today, I'm interviewing children's folk tale author Segilola Salami! Segilola is a devoted mother, and her writing is inspired partly by her experience of motherhood, and partly by the stories her own mother used to tell her. You can connect with her on Facebook, Google+, Twitter, and Goodreads. You can also subscribe to her YouTube channel. Welcome to the blog, Segilola! First, tell us a bit about yourself. What books have you written, and what genre are they? Tell us more about your books! 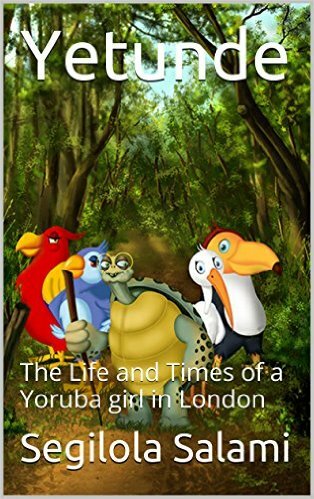 Yetunde is a series of stories that follows the every day life of 6 month old Yetunde as she's narrated African folktales by her mom Iya Yetunde whilst growing up in London. Iya Yetunde also tries to improve her Yoruba speaking ability, so we see a nice mish mash of Yoruba and English. The folktales are of West African origin. What ages are your books for? Ideal for parents to read to younger children. Ideal for older children to read themselves. My mom and my daughter. Inspiration as a first time mom. In secondary school, but I never for once imagined I would try to make a career out of it. Books by Hardly Chase and Stephen King. Do you have any advice for up-and-coming authors? Writing is the easy bit. The hard work comes in promoting your book. You are currently an indie author. But if a traditional publisher contacts you to publish your book, would you accept their offer? If the offer was reasonable, yes I would. If you're a children's author, and you would like to be interviewed for this blog, Click Here.